I told Zoulah not to do it -- it is too scary for my family-friendly blog -- but, she just couldn't help herself! So here are some scary and scrumptious and naughtily delicious cookies. 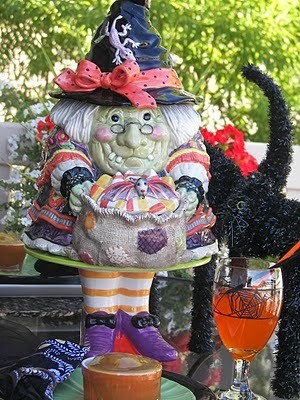 Zoulah screeched with delight when she saw the new Halloween header that our Fairy Blog Mother, Linda made for her today! It was a surprise! Don't you just love it? Thanks sooo much Linda! Okay, so Beaulah, Purple Chocolate Home's kitchen witch is going to get a chuckle out of this recipe. Joni and Jacqueline have squabbled, politely of course, about the best recipe for royal icing cookies. Jacqueline uses this three-ingredient recipe, (using a white cake recipe) Joni uses this recipe. The other day, the youngest Red Coucher made this Red Velvet cookies with this recipe...and we all loved it. He wants to take a bite. So Zoulah is going to give you the recipe for these three-ingredient cookies. Preheat oven to 350 degrees. Put all ingredients in medium mixing bowl and mix well. Zoulah's Notes: Our oven only takes 9 minutes. Your baking time may be different. You want these cookies to be soft and pillowy so don't overbake! You could use a different brand of cake mix: we just have made quite a few batches of these with the Betty Crocker brand. The Count invites you to take a bite! Love the blog header! I bet Zoulah is happy with it also. Those cookies would be welcome here with a cold glass of milk! Love your Halloween header, Joni! These cookies look good. I love anything red velvet! Joni, the new blog header is too cute! Red velvet cookies ~ gotta make some of these. Thanks for sharing. So cute Joni.Even I might find time to make these. Have to try these sometime! LOVE the blog header for October! And my grandkids would love making these cookies. Thanks for the tips! These sound simple, and look so pretty! Love the Halloween header, Joni!